Most smartphone owners, if not all of us, know what a push notification is. It is basically a message sent to a user of a third-party app or service, much like a text message. Even though we get push notifications throughout the day, it is rare that we think about the process of sending an effective one. The point of a push notification is to add value to the user’s experience of an app or to encourage them to engage in certain behaviors. When a user taps on a push notification, it normally takes them to the app, where they can then perform those actions. The average cell phone in the US gets about 46 push notifications a day. Of course, people could always choose to ignore these messages. These days, data shows that the average mobile app loses 73% of users within 48 hours of the download. Push notifications help keep apps top-of-mind and encourage interaction with the app so as to retain these users, and have been found to increase retention by 23% after three months. There are, however, certain phrases or apps that users are more likely to engage with. Even the time of day the notification is sent makes a difference. There are some tactics apps can use to retain users and increase conversions, but first apps have to focus on making sure that users opt-in to receive push notifications. A large percentage of people do not opt-in to get push notifications from apps. Only 60% of Android users and 45% of iPhone users actually do. This is most likely because they have had negative experiences with push notifications from other apps, and so do not want similar problems again. Often, it is mainly a problem of clutter — people do not like getting barraged with irrelevant information. A good solution to this is to let users know what kind of notifications the app will be sending them, so they know what to expect and can make an informed decision as to whether they want these push notifications or not. Mobile marketers need to find the balance between sending friendly push notifications that are received well and obnoxiously trying to get users to purchase something. Keeping products top of mind is important, but it should not be in a negative way. Sending out push notifications in a way that creates a positive association with the app in the user’s mind can be tricky. 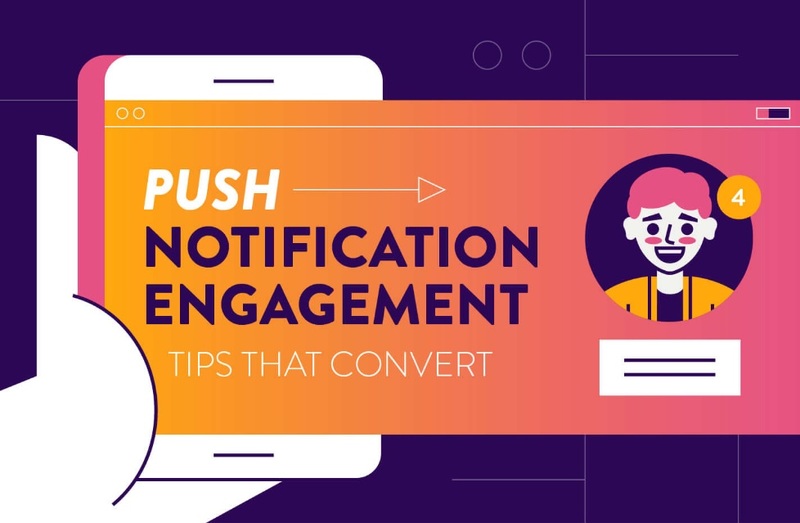 CleverTap looked into the best strategies for turning push notifications into conversions and after analyzing 40 billion push notifications, collected their tips in an infographic. The first thing to consider is that there are certain times during which people are more likely to tap on the notification, and these are not necessarily the same as the times that apps tend to send out the maximum number of push notifications. The hour between 7 am and 8 am see the maximum click-through-rate (CTR), but not a lot of apps take advantage of this. Sending out push notifications during times that people are likely to engage with them is an effective strategy that is surprisingly not used by a lot of brands. Supplying users with concise, relevant information is also important. Long-form content in any push notification is inevitably cut off by the operating system, and users are much more likely to dismiss the notification than to actually engage with it. Using somewhere between 20 and 90 characters has been shown to lead to the highest CTR. Some industries have inherently higher CTR’s than others. Business/Finance and Entertainment/Events have the highest rates, while Food Delivery and Retail have the lowest rates. The industry and type of notification also affect how long they should be. For example, notifications for deals and coupons should ideally have 20 characters, while for travel and hospitality they should have closer to 90 characters. Of course, open rates are still low in general, but giving users quality information in push notifications can give an app an edge over others and provide value to the user that they might reciprocate. Another facet to think about is whether the push notification is personal and whether it feels like it has been written by a human. Basic personalization in push notifications has been shown to increase open rates by 9.06%. Using emojis and casual phrases make these messages feel like they are from a friend, which leads to a 70% increase in CTR. It is well-known that people are more likely to do something if they feel a sense of urgency tied to it, and so time-sensitive offers tend to result in the highest conversions. Using words like “discount,” “today,” and “hurry” can really help get users’ attention and have them tap on the notification. Following these tips and tricks can really get brands to increase their CTR and also benefit users by letting them know important information that they can get value from. Even though knowing what a push notification is a common knowledge, very few people know or pay attention to the intricacies of actually sending an effective push notification. In this day and age, the way we engage with notifications is subconscious, and brands can use certain ways to get us to notice them more. Consumers don’t ignore or dismiss something of value, and providing that in their push notifications is what brands should be focusing on.